"Inspired by the mouthwatering appetizers served in Italian restaurants in New York City's Little Italy neighborhood, these cheese ravioli with a light, crunchy RITZ cracker crust and grated parmesan cheese will be a hit at any party. Serve hot with marinara sauce for dipping for a delicious, quick and easy appetizer." In a large frying pan, over medium heat, add the vegetable oil until it is about 2 inches deep. Heat to 325 degrees F.
While the oil is heating, place the RITZ Crackers in a food processor and pulse until the crackers are crushed into fine crumbs. Pour the crumbs into a shallow dish. Add the garlic powder, pepper, Italian seasoning and 2 tablespoons of the parmesan cheese. Stir until all spices are evenly distributed. Whisk together the egg and milk in a bowl. Dip each ravioli in the egg mixture, then into the RITZ cracker crumbs. 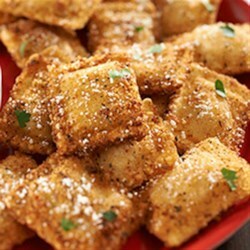 Be sure each ravioli is evenly coated with cracker crumbs. Shake off any excess. Once the oil is hot enough, add small batches of the RITZ cracker-coated ravioli into the oil. Fry for approximately 1 minute on each side. Watch closely so they do not burn; they cook quickly. When ravioli are golden brown on each side, remove from the oil and place on a paper towel-lined plate to drain. Sprinkle the ravioli with remaining grated parmesan cheese and (optional) chopped parsley. Serve with warm marinara sauce for dipping. If you substitute RITZ Garlic Butter Crackers you won't need to add garlic powder to the crumb mixture. Love these!! I like how crispy they turned out and the flavor was great! They disappeared quickly. I will definitely be making these again! Didn't have crackers, so I used seasoned bread crumbs. Delicious! I came up with this recipe for Ritz using refrigerated ravioli. They were so quick and easy to make and so yummy! I had to go back and make another batch because they went so fast!